Though each has a unique journey, they all enrolled in our Earn + Learn program for a common goal: to improve their economic prospects through better-paying jobs. They are now fulfilling this goal. Our latest graduating Earn + Learn class has seven members. They received certificates marking their accomplishments at a recent celebration. This Earn + Learn cohort focussed on job opportunities in truck driving (CDLA) and hi-lo/forklift operation. 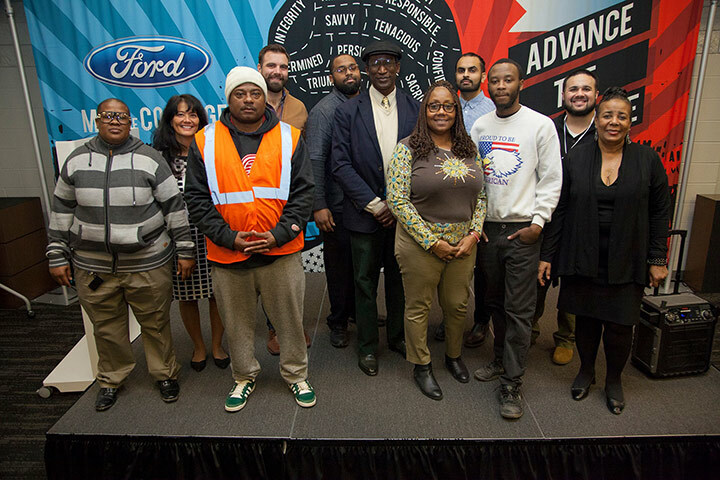 Program participants first completed four weeks of work-readiness training and then proceeded to either the US Truck Driver Training School in Sterling Heights or the Detroit Training Center (which conducts the hi-lo/forklift training). Many of the graduates already have secured jobs or job offers related to the training they chose. “The program is a good stepping stone to a better future,” said graduate Tyler Ayers, who is now working as a forklift operator for Universal Trucking in southwest Detroit. The graduation event took place at the Ford Resource and Engagement Center (FREC City) on the east side. Earn + Learn is a free program for Detroit, Highland Park and Hamtramck residents. To enroll or learn more, contact Manny at 313-297-0091 or email. See the photos and more information in the Facebook story.